A man believed to be the last surviving worker who helped construct the San Francisco Bay Bridge and the Golden Gate Bridge has died. He was 97. Harry Fogle died Feb. 10 of natural causes at a Roseville hospital, according to the San Francisco Chronicle. Fogle was born on a Wisconsin dairy farm and moved to California in 1935 when he got a job on the Bay Bridge painting the towers and supporting cables. 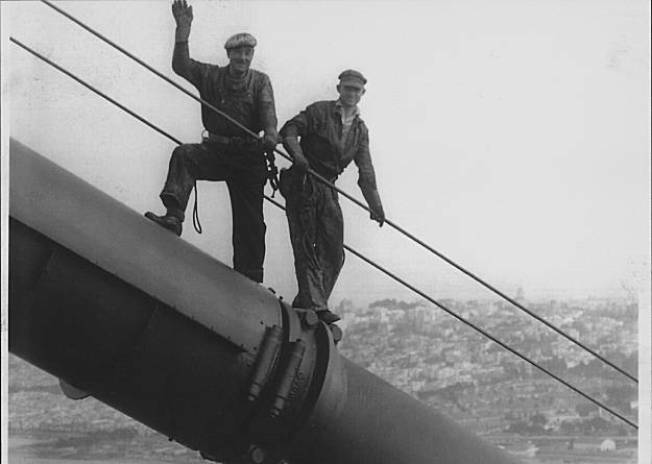 He was paid $11 a day to work hundreds of feet above the bay with no safety net. The next year, he transferred to the unfinished Golden Gate Bridge. He worked on a "high gang," often painting the bridge's 746-foot-tall towers. He also painted portions of the Carquinez Bridge. He retired as a Golden Gate Bridge painter in 1976. Golden Gate Bridge district spokeswoman Mary Curie told the Chronicle that Fogle appears to be the last surviving worker of both bridges. Fogle is survived by his wife, Marie; two daughters, JoAnn Tripp of Fair Oaks and Judith Kemp of Cool; a son, Steve Fogle of Rohnert Park; seven grandchildren; and eight great-grandchildren.